The functionality of this site is limited with cookies disabled. Follow these simple instructions to enable cookies in your web browser. What is an Art and Design Degree? People are receiving more of their information through visual media (online, television, etc.) than ever before. As such, the ability to present information in a meaningful and impactful way is gaining increasing importance in the 21st-century economy. This is true both within traditional creative fields such as Advertising, Architecture and Media Production, as well as newly developing fields that are growing by the day. How can you make this trend work for you? An Art or Design Degree would be a good place to start. Magazines, books, advertisements—not to mention websites, blogs and social networking outlets—all these institutions rely heavily on the skill of graphic and web designers to make their content readable, professional and effective in presentation. 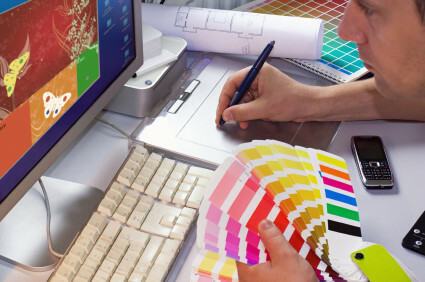 A formal education in design will teach you how to become an expert in the tools of the trade. Adobe Illustrator, Drupal and HTML5—these are the front-line building blocks of the information economy, and mastering them can help you pursue a long and successful career in visual/graphic design, Web Development and Design or something more specialized such as Audio Engineering. How can I get an Art and Design Degree? A degree in art can be earned at a variety of colleges and universities all over the world. Experts with degrees in Art or Art History can pursue careers in things like art, sculpture, art buying and museum curation. Individuals trained in Fashion can become fashion designers, fashion critics, buyers or image consultants. A degree in Interior Design can unlock a career as an interior designer, someone who organizes and arranges indoor spaces in creative, nourishing and exciting ways. Associates, bachelor's, masters and PhD degrees are all available at certain colleges and universities. It all depends on how much time you wish to put into your education. Sorry, currently there are no schools that meet your criteria.